For the former federal electoral district, see Montreal West (electoral district). For the former provincial electoral district, see Montréal-Ouest (provincial electoral district). Location on the Island of Montreal. (Outlined areas indicate demerged municipalities). 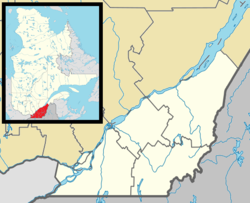 Montreal West (French: Montréal-Ouest) is an on-island suburb in southwestern Quebec, Canada on the Island of Montreal. Montreal West is a small, close-knit community made up primarily of single-family dwellings. The town is largely composed of young families, and has a population of 5,085, as of the 2011 census. The town's area is 1.6 km². About 66% of the population of Montreal West speak English as their first language. The core business area of Montreal West is located on Westminster Avenue between Milner and Curzon. Until 2010, it consisted exclusively of small, non-franchised businesses, but in a controversial decision, the Pharmaprix drugstore chain was allowed to open a large outlet on the corner of Westminster and Sherbrooke Street. On January 1, 2002, as part of the 2002–2006 municipal reorganization in Montreal, Montreal West and the neighbouring suburbs of Côte-Saint-Luc and Hampstead were merged into the City of Montreal and became the borough of Côte-Saint-Luc–Hampstead–Montreal West. Following a change of government and a 2004 referendum in which the population voted to de-merge by a wide margin, Montreal West was reconstituted as an independent city on January 1, 2006. The Town of Montreal West is served by its mayor, Beny Masella, and four city councillors. Beny Masella is responsible for Intergovernmental and Media Relations. In terms of services, the town has its own public works division, Public Security Department, a fire station, a community centre (named after former town mayor John A. Simms), and a Town Hall. Brock Avenue in Montreal West. The town's various codes and ordinances are upheld by its Public Security Department, consisting of a lieutenant with a team of "By-Law Enforcement Constables" under his supervision. The Town of Montreal West shares a federal riding with the city of Westmount and the Montreal neighbourhood of Notre-Dame-de-Grâce. The riding is known as Notre-Dame-de-Grâce—Westmount and its Member of Parliament is Liberal Marc Garneau. Provincially, Montreal West again shares a riding with Notre-Dame-de-Grâce. The riding is known as Notre-Dame-de-Grâce and its Member of National Assembly is Liberal Kathleen Weil. Royal West Academy, the highest rated English-language public school in Quebec. Montreal West is notable for having Quebec's highest rated Anglophone public high school, Royal West Academy (ranked 39th overall in 2005 by the Fraser Institute). It also has two Anglophone elementary schools, Elizabeth Ballantyne Elementary School and Edinburgh Elementary School which offers French immersion. These schools are part of the English Montreal School Board. The town has a public children's library located in Elizabeth Ballantyne school. A library for all age groups is located on Westminster Avenue. A train passing through Montréal-Ouest train station. Montreal West is serviced by six Société de transport de Montréal bus lines. Each of these connects to a corresponding Montreal Metro (subway) station. The Montréal-Ouest Train Station also services the area. Trains that run through this station connect passengers to downtown Montreal on one end, and three different routes heading away from the city at the other end. St. Philip's Church in Montreal West. Montreal West includes three medium-sized churches. One is United (Montreal West United Church ), one is Anglican (St. Philip's Church), and the final is Presbyterian (Montreal West Presbyterian Church). The Montreal West United Church also rents space to a Pentecostal service (Overcomers Assembly). St. Philip's Anglican Church rents space to the New Life Korean Presbyterian Church. Canada Day is the largest community event of the year in Montreal West. Residents organize a parade route that mainly runs down the main street of Westminster and ends at Strathern Park. Floats represented in the parade include organizations and clubs located in town, as well as some created personally by residents. In some years, there have been water fights between sidelined residents and members of the parade (mainly the swimming pool float). Water fights during these years have seen water balloons and super soaker water guns, as well as the odd hose drawn from a house. Organizers have tried to minimize these activities in recent years so as not to detract from the parade itself, with varying success. Following the parade, residents converge on Strathern Park for a giant picnic/BBQ. Many children's games and activities go on at the park, as well as in the nearby Percival park. The final event of the evening is the fireworks, which take place around 10pm at Hodgson Field. Annually on June 23 (the day before the actual holiday) there is a picnic at Davies Park, featuring music performed by Québécois musicians. In the late evening, a large bonfire is held in the centre of the park. The Garbage Bowl is a yearly tradition held every January 1 since 1950, where men from Montreal West separate into two teams, the Northern Combines in red longjohns and the Southern Bombers in green longjohns, and play a football game in the frigid weather with proceeds from donations, food, and commemorative pins going to charity. The War Memorial of Montreal West. The town of Montreal West has a large number of neighbourhood parks and public spaces. They include: Dave Reid Park, Davies Park, George Booth Park, Hodgson Park, John A. Simms Park, Kirkpatrick Park, Memorial Park, Percival Park, Ronald Park, Roy D. Locke Park, Rugby Park, Sheraton Park, Strathearn Park and Toe Blake Park (which was named after former Montreal Canadiens head coach Toe Blake). The town also has an indoor ice skating rink, clay tennis courts, and a public swimming pool. "Montreal West: The Garden Suburb"
^ "Proposed pharmacy draws controversy". CBC News. October 21, 2010. ^ "Profil sociodéographique: Ville de Montréal-Ouest" (PDF) (in French). Ville de Montréal. 2013. Retrieved 28 October 2013. ^ "The Council". Town of Montreal West. Archived from the original on March 19, 2008. Retrieved 2008-05-20. This page was last edited on 17 March 2018, at 17:06 (UTC).